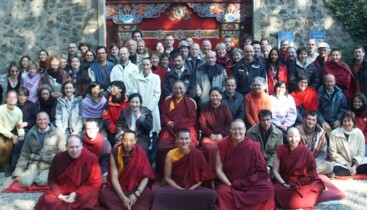 Khenpo Namdrol teaches the Rigpa Shedra East and a number of Lamas, monks, nuns and western students, 2009 in Pharping. Rigpa Shedra — Rigpa's intensive study program that takes place in Pharping, Nepal under the guidance of Khenpo Namdrol. Inspired by the vision of Sogyal Rinpoche and the achievements of great centres of buddhist learning from the past, such as Nalanda in India, Shri Singha shedra at Dzogchen Monastery, Kham-jé at Dzongsar and more recently, Larung Gar, established by the great Khen Rinpoche Jikmé Phuntsok, the Rigpa Shedra seeks to provide a thorough and comprehensive Dharma education of the very highest standards. The approach is traditional, based on the proven methods of the unbroken lineage of learning and realization that dates back to ancient India, and encourages not just formal study, but also deeper integration of the teachings through contemplation and meditation. The curriculum is designed with a view to supporting the needs of the wider Rigpa Sangha, complementing the teachings of Sogyal Rinpoche and also the courses offered in Rigpa centres throughout the world. It is entirely non-sectarian, and features the most important writings of the great Indian and Tibetan masters, including works on both sutra and tantra. The teachers providing commentary on these texts are highly qualified khenpos and acharyas. Additional teachings and guidance are also sought from many of the lamas connected with the Rigpa sangha. In addition to studying the most important classical writings, students have the option to study the Tibetan language, and all the major and minor sciences studied by the panditas of India and Tibet, including the history of Buddhism in India and Tibet, Tibetan medicine, astrology, grammar (according to the main Tibetan grammar treatises), poetry and arts and crafts. In 2006 the first Rigpa Shedra East took place at the Palyul Retreat Centre in Pharping, Kathmandu Valley, Nepal. Students spent four months studying Mipham Rinpoche’s Gateway to Knowledge with Khenpo Pasang Tenzin, translated by Gyurme Avertin. In 2007, the shedra focused on Shantideva's classic text, the Bodhicharyavatara, with Khenpo Sönam Tobden, translated by Gyurme Avertin. MP3 audio files of these teachings are available here. The Shedra 2007-2008 studied Mipham Rinpoche’s commentary The Adornment of the Middle Way, Shantarakshita’s Madhyamakalankara with Commentary By Jamgön Mipham, with Khenpo Sönam Tobden, translated by Gyurme Avertin. Buddha nature was the main topic of the Shedra 2008-2009, following two commentaries by Mipham Rinpoche: The Lion's Roar: A Commentary on Sugatagarbha, taught by Khenchen Namdrol, and Mipham Rinpoche’s commentary on the Uttaratantra Shastra (Tib. Gyü Lama), Buddha Maitreya’s famous treatise, taught by Khenpo Dawa Paljor and translated by Gyurme Avertin. The main text studied at Shedra East in 2010 was Madhyamakavatara (Tib. Umajukpa) and its auto-commentary by Chandrakirti, with Khenpo Sönam Tobden, translated by Gyurme Avertin. Teachings on Mipham Rinpoche's commentary on the Abhisamayalankara with Khenpo Sönam Tobden, translated by Stefan Gueffroy. Shedra East students studied either Shantideva’s Bodhicharyavatara, using the commentary by Khenpo Kunzang Palden, taught by Ane Lopön Damchoe Wangmo and translated by Melanie Slomka and Damien van Effenterre, or the Guhyagarbha Tantra, using the commentary by Mipham Rinpoche, taught by Khenpo Sönam Tobden and translated by Gyurme Avertin. Three texts were offered to Shedra East students for study: Shantideva’s Bodhicharyavatara, taught by Ane Lopön Sangye Paldrön and translated by Melanie Slomka and Damien van Effenterre; the Khenjuk, by Mipham Rinpoche, taught by Lopön Tenzin Wangdü and translated by Damien van Effenterre and Roger Espel Llima; and the Guhyagarbha Tantra, using the commentary by Dodrupchen Jikmé Tenpé Nyima, taught by Lopön Tashi Tseten with translation by Ane Lopön Damchoe Wangmo (Canada). Shedra East students studied the Bodhicharyavatara, taught by Ane Lopön Phuntsok Chamdrol and translated by Christina Monson; Shantarakshita’s Ornament of the Middle Way, with commentary by Mipham Rinpoche, taught by Lopön Lodrö Palge and translated by Damien van Effenterre; and Finding Comfort and Ease in the Nature of Mind, part of the Trilogy of Finding Comfort and Ease by Longchenpa, taught by Khenpo Gyatso with translation by Ane Lopön Damchoe Wangmo (Canada). In addition Khenchen Namdrol taught for six weeks to 76 students. The three texts offered to Shedra East students for study included the Bodhicharyavatara using Khenpo Shenga’s commentary, taught by Ane Lopön Phuntsok Chamdrol and translated by Daniela Hartman and Han Kop; Maitreya’s Uttaratantra Shastra using Mipham Rinpoche’s commentary as well as his The Lion's Roar: A Commentary on Sugatagarbha, taught in English by Ane Lopön Damchoe Wangmo (Canada); and the Guhyagarbha Tantra with commentary by Mipham Rinpoche, taught by Lopön Tashi Tseten, with translation by Christina Monson. An additional six students joined the Uttaratantra class for a one-month short option teaching on the Four tenet systems, using Mipham Rinpoche's Summary of the Wish-Fulfilling Treasury’s Chapter on Tenet Systems, based on a text by Longchenpa, also taught in English by Ane Lopön Damchoe Wangmo (Canada). The Shedra East students received teachings on the Bodhicharyavatara, taught in English by Chantal Bergers; Chandrakirti’s Introduction to the Middle Way, using Mipham Rinpoche’s commentary, taught in English by Ane Lopön Damchoe Wangmo (Canada); or the vajrayana chapter of Jikme Lingpa’s Yönten Dzö, taught by Lopön Tashi Tseten and translated by Christina Monson. The Shedra East students received teachings on the Abhisamayalankara, taught by Lopön Penpo Tsering and translated by Roger Espel and Han Kopp. Shedra East also hosted students of the Milinda Programme who studied four different Madhyamaka texts, each for a two week period. The Shedra East students received teachings on Shantarakshita's Madhamakalankara, Ornament of the Middle Way, taught by Lopön Tashi Tseten and translated by Damien van Effenterre, and Mipham Rinpoche's commentary on the Guhyagarbha Tantra, The Essence of Clear Light, also taught by Lopön Tashi Tseten and translated by Christina Monson. The Shedra East students received teachings on the Bodhicharyavatara, taught in English by Verena Pfeiffer; and Mipham Rinpoche’s Beacon of Certainty, taught by Khenpo Tashi Tseten and translated by Christina Monson. Also this year, another Shedra East first, Chantal Bergers taught, based on Verena Pfeiffer's Bodhicharyavatara course, an on-line course which was followed by over almost 90 students. The Rigpa Shedra began in Lerab Ling in the summer of 2001. Dzigar Kongtrul Rinpoche and Ringu Tulku Rinpoche both taught on the ninth chapter of Shantideva’s Bodhicharyavatara. For the second year, Dzigar Kongtrul Rinpoche gave a commentary on Maitreya’s Uttaratantra Shastra, Ringu Tulku taught Mipham Rinpoche’s Wheel of Analysis and Meditation and Professor Steven Goodman introduced the basic themes of the Abhidharma. For the third year, which took place in Dzogchen Beara in Ireland, Dzigar Kongtrul Rinpoche taught on Maitreya’s Abhisamayalankara and Alan Wallace presented the views of the four main philosophical schools of Buddhism. Students also reviewed Ringu Tulku Rinpoche’s teachings on the whole of the Bodhicharyavatara. For the fourth year, Dzogchen Rinpoche taught on the Abhisamayalankara and introduced us to buddhist debate, and Ringu Tulku Rinpoche began his teachings on Shantarakshita’s Madhyamakalankara using the commentary of Mipham Rinpoche. In the fifth year, the shedra was once again at home in Lerab Ling. We had the pleasure of welcoming back Ringu Tulku Rinpoche, the Rigpa Shedra’s most regular teacher, for the second and final year of his brilliant commentary upon Mipham Rinpoche’s celebrated exposition of the Ornament of the Middle Way by Khenpo Shantarakshita. Each day, Rinpoche delivered a brilliant and seemingly effortless summary of as many as thirty or forty pages of text, masterfully encapsulating the essential meaning of the treatise. For the second part, we had the good fortune to study Haribhadra’s Sphutartha commentary on the Abhisamayalankara with the young and brilliant Khenpo Jampal Dorje from Dzongsar Monastery in India. During his lively and extremely detailed presentation, he drew upon the writings of the great Sakyapa master Kunkhyen Gorampa and especially upon the annotation commentary of the great Khenpo Shenga, to whose lineage he himself belongs. On the final day, as both a thank-you and an offering, three students were called upon to present their understanding of the text, and all acquitted themselves admirably, speaking from memory for more than five minutes each and even managing a few quotations. Khenchen Pema Sherab finished Mipham Rinpoche’s Beacon of Certainty and then began teaching the Yönten Dzö by Jikme Lingpa, with translation by Khenpo Tensing Norgay and Gyurme Avertin. Khenchen Pema Sherab Yönten Dzö starting with Chapter 3 with translation by Khenpo Tensing Norgay and Gyurme Avertin, also by delayed streaming. Khenchen Pema Sherab Yönten Dzö with translation by Khenpo Tensing Norgay and Gyurme Avertin, also by delayed streaming. Khenchen Pema Sherab Yönten Dzö sections on entrance to the bodhisattva path and the Bodhisattva vow with translation by Khenpo Tensing Norgay and Gyurme Avertin also by delayed streaming. Khen Rinpoche also gave the Bodhisattva vow to the entire Lerab Ling community. Khenchen Pema Sherab Yönten Dzö sections on the Bodhisattva vow and the Precepts of Bodhichitta in Aspiration and Action, with translation by Khenpo Tensing Norgay, also by delayed streaming. Khenchen Pema Sherab Yönten Dzö Vajrayana, Volume II, classification of tantra, empowerments, and samaya, with translation by Khenpo Tensing Norgay also by delayed streaming.